Chechen is also called Black Poisonwood, so named for its toxic black sap that can cause severe allergic reactions. 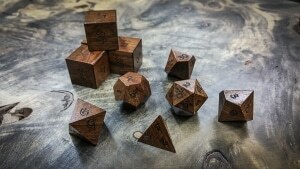 Don’t worry, your dice won’t be poisonous: Chechen wood is perfectly safe to handle, and only its sap is toxic. Chechen can vary throughout a wide range of tones. Reds, oranges, browns, and contrasting dark stripes characterize this wood. This variation makes each set of dice extremely unique. While not a true rosewood, it’s often sold under the name Caribbean Rosewood due to its density and rosewood-like coloration. I’ve been browsing your website to decide which set of dice i want to order and i think it’s going to come down to what type of opals you use, are they lighter in color or darker? And do you know the brightness of the fire in the stone itself? Really jazzed about the quality of these dice. I’m only bummed that the Katalox is a little out of my price range. hi matt, glad you like our work. we used a crushed opal that is a translucent blue/white in color. it does have a nice fire effect before we crush it, and we try to use the largest pieces possible to retain as much of the opalescence as possible.